BOSTON - For the first time, a stellar eruption called a coronal mass ejection has been spotted fleeing a distant star. Such outbursts of plasma and charged particles are well-known on the sun, and commonly follow a burst of light called a solar flare (SN Online: 4/17/15). Astronomers had detected flares on other stars, but never a corresponding coronal mass ejection, or CME, until now. The discovery could have implications for the prospects for life on planets in other star systems. The ejection in question relates to a flare that was actually detected 10 years ago, from a giant star called HR 9024 about 450 light-years from Earth. The star is about three times as massive as the sun and 10 times as wide. Astronomer Costanza Argiroffi of the University of Palermo in Italy and colleagues found evidence of the star's outburst using a new method for analyzing data taken with the Chandra X-ray Observatory, Argiroffi told the Cool Stars 20 meeting on August 2. Argiroffi's team detected material moving up and down a loop of plasma extending from the star's surface during the flare by measuring certain X-rays' Doppler shift - the change in the wavelengths of the X-rays as material moved toward or away from the Earth. The researchers saw more material moving away from the star after the flare had stopped, and interpreted the observation as a coronal mass ejection. "People have looked for this for a long time, and this is the first time this has been seen," says astrophysicist Julian Alvarado-Gomez of the Harvard-Smithsonian Center for Astrophysics in Cambridge, Mass., who was not involved in the work. The ejection contained about 1 billion trillion grams of material, which is about what scientists expected based on estimates that extrapolated from the sun's CMEs to bigger stars. But the outburst’s kinetic energy, measured by the escaping material's speed, was much lower than expected. The star's strong magnetic field may have held the eruption back, Alvarado-Gomez suggests. His group has run computer simulations that show that a strong magnetic field can sometimes act as a cage that keeps a CME tethered to the star, or slows the progress of ejections that make it out. That could help explain why scientists haven't detected a CME from another star before. Strong stellar magnetic fields are associated with more flares, which should cause more ejections, so scientists have wondered at not being able to spot one. Such a magnetic impediment could be good news for orbiting exoplanets, if HR 9024 has any. 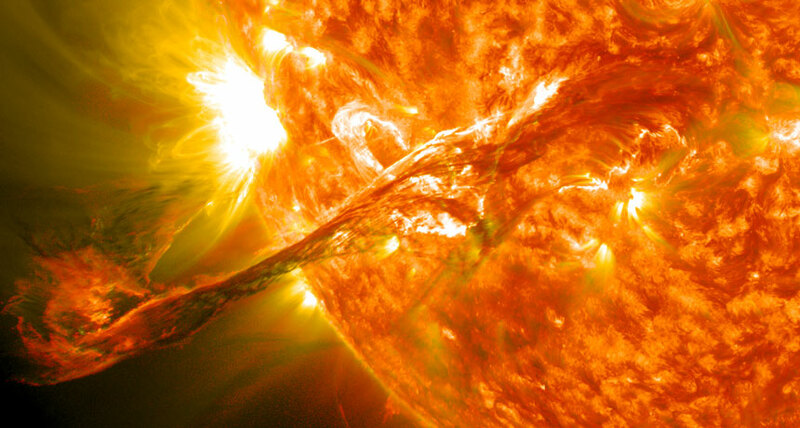 In our solar system, the energy and matter released in both flares and CMEs can wreak havoc on planets. Earth is mostly protected by its own magnetic field, but Mars is not so lucky (SN: 12/12/15, p. 31). While a strong magnetic field could help keep a star's planets safe from the ravages of CMEs, it could be a double-edged sword, Alvarado-Gomez says. "The bad news is this energy has to go somewhere, and maybe it goes into powering more flares," which aren't weakened by the field. Many of the potentially habitable exoplanets that astronomers have discovered orbit very close to particularly flare-prone stars (SN Online: 3/5/18). "If those flares are accompanied by these particle emissions at the same rate that they are in the sun," says astronomer Cynthia Froning of the University of Texas at Austin, "it's going to be very detrimental to the formation of life and the maintenance of those planets' atmospheres."